The grenade that a bicycle-riding ONH Volunteer threw at the PSNI on Friday was of military standard. It injured three PSNI men and blew a hole in a curb. Previously, the ONH and the Real IRA have used much less powerful homemade pipe bomb that often fail to detonate. 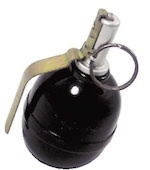 The new ‘Russian-style’ grenade is sdaid to be capable of inflicting casualties within three metres. In the attack on Friday night, the ONH is believed to have staged an armed robbery at a west Belfast bookmaker’s to lure a PSNI patrol into the area. An ONH Volunteer rode up inconspicuously on a bicycle and lobbed a grenade at them outside shops on the busy Shaw’s Road. The PSNI unit was too shocked to prevent his getaway. The attack was quickly claimed by the organisation to a number of Belfast newsrooms using a recognised codeword. Sinn Fein assembly member for the area, Paul Maskey, condemned the attack. “There are a lot of shops and eating places, it’s a residential area and there’s a GAA [Gaelic Athletic Association] club. We’re very lucky that there were not more injuries than there are,” he said. More reminiscent of the Tom Barry era of 1920s rural Ireland than Belfast in 2010, the grenade attack has stunned British security chiefs. This was a ‘back to basics’ style attack, involving one man on a pushbike armed with a hand-propelled grenade. However, what the ONH lacked in weapons and manpower they more made up for in local knowledge. The area around Shaw’s Road shop fronts was one favoured over the years by their predecessors in the Provisional IRA because of its strategic location. Surrounded by several blocks of flats and a labyrinth of alleyways and pedestrian-only access points this is traditionally a no-go area for British forces. The direct attack on Crown force personnel signals a new strategy by Oglaigh na hEireann. Over the past two years, it has focussed on large-scale bombings and roadside devices using home-made explosive, as well as more indirect limpet mine attacks. The use of the grenade has opened the possibility that ONH has managed to obtain a supply of new weapons yet to be deployed. In particular, it will be difficult for the PSNI to carry out patrols while still protecting its members from such random and potentially lethal attacks. It is clear Friday night’s events leave British militarists with a serious problem in the North of Ireland. * The ‘Real UFF’ have claimed two pipe bomb attacks in the St James’ area of west Belfast last week. They said one bomb left was left at the wrong home, while the second was targeted at a prominent local republican.